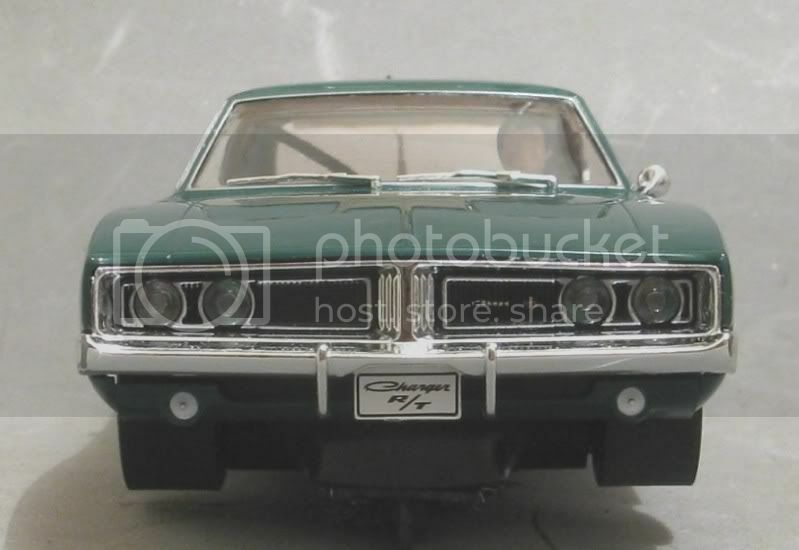 The Slotcar Outhouse • View topic - Pioneer v. Scaley Dodge Chargers. Pioneer v. Scaley Dodge Chargers. I hadn’t really bothered with either of these models as far as acquisition was concerned because they are road liveries and looked too nice to put a few dents and scratches in, but a chance conversation with local racer Mike saw me bringing away both models from his place for the purpose of comparing the models and especially the manufacturers. In my neck of the woods Pioneer still have a lot to prove. Several racers of various abilities have purchased the Mustangs hoping they would be a panacea for the slotcar blues. Scaleys have traditionally dominated the SCCA classic Trans Am classes we run and with the advent of the Pioneer cars, there has been a surge of their models in the racing. But I can’t honestly say they have had more race wins than beyond the increase in numbers on the track. One thing they have done is to bring back some lifelike race car attributes to the model raceway. I’m talking about the noticeable increase in the mechanical failures of the model, to wit, the loss of wheels! Once the reserve of Scaley models, it now seems that Pioneer has stolen that crown; and replacements are still not available, yet? But that’s another story. As we know, there is more to a good slotcar than its speed and reliability; and because this review is based on the presentation of each model and not its track performance, we need to focus on exactly those things that make it a good model, racing or not! And, believe it or not, there are some brickbats and bouquets......for both models! So what de we get for our bucks? The Scaley model will set locals back $52.00 and the Pioneer, $59.00 if you shop around. Scaley packaging is good but the only extras available in the flip top box are a couple of the now familiar circular braid plates. Pioneer have covered most bases with their model and underneath the base is a packet of spare goodies. 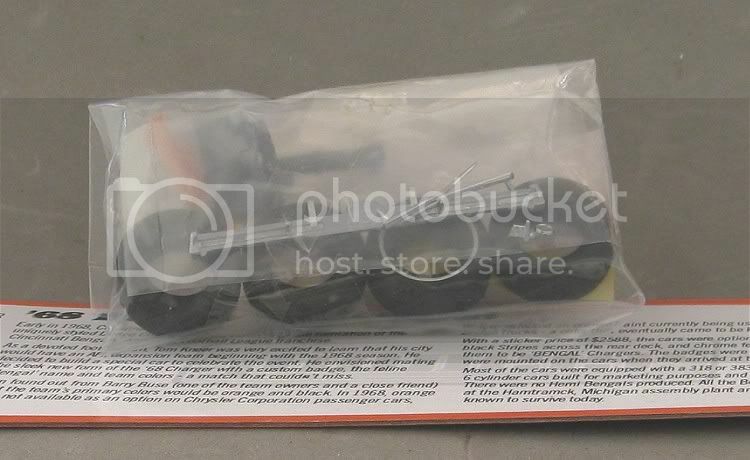 This spares pack includes things like a 7.0 m.m. deep guide, wiper arms, a door mirror, a pair of braids, a set of tyres, a Pioneer sticker? And.... a rear bumper!! Most thoughtful! So they have intended this model to be put on the track! It has to be admitted that the Bengal is a very striking livery and it would be easy to rave on about the model based on its livery, but wait....there’s more! The Bengal has a good shine to it and body detail is exceptionally well applied and the anodised bits certainly sparkle. The front grille is well modelled and very impressive and the rear of the model is also well up to scratch, they have also excelled with such detail as door handles inside and out! No QA problems here. The Scaley model has a little less anodised detail and the greenness of the model overpowers a bit and it seems not to shine like the Bengal. But it still has good bumper and grille detail. Different but still as attractive. 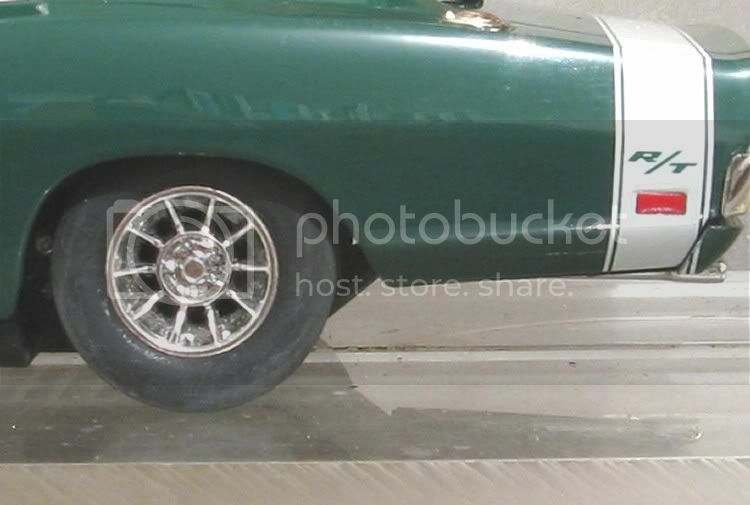 The Pioneer wheels are a bit of a treat, they are a fairly good reproduction of the chromed steel Magnum 500 styled wheels which were very popular about this time and available as an after market accessory. Tyres too are particularly soft, and, if the Mustang is anything to go buy, they will have plenty of grips. The Scaley wheels are good too. Concentric and nice rubber, possibly a little harder than the Pioneer but still good, but just a bit too chromey. I’m sure these wheels are supposed t be reproductions of alloy wheels and as such, are a little too shiny. Looking through the side windows it is easy to see that Pioneer have focused a bit more on a nice interior. 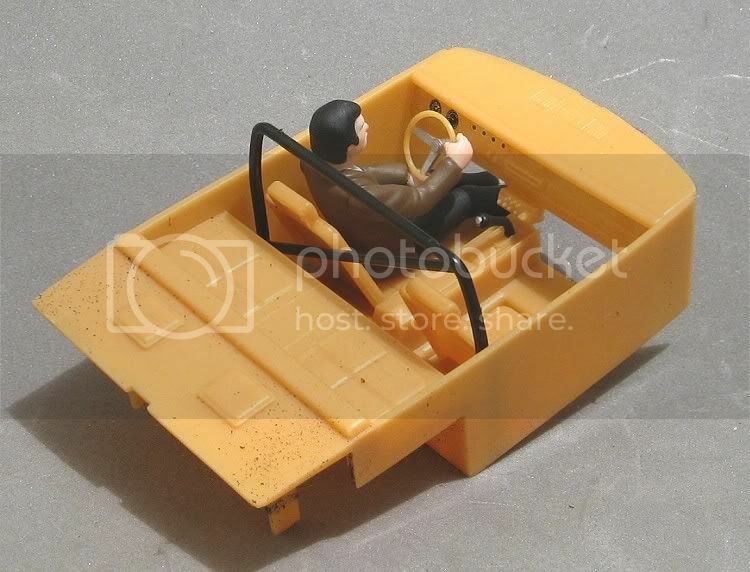 They have even posed the driver with his hand on the shift lever! The door panels have good detail with handles and winders all picked out and even the door panels themselves are well moulded. The dash has excellent detail and there really isn’t a lot more needed inside the model. The Scaley drivers tray has the advantage of being removable, and as such it is easy to see what Scaley thought was best for their interior. The drivers tray is finished in basic plastic and although there is plenty of detail, most of it is in material colours only. The only addition is a black roll bar. A steady hand could quite easily put a bit of life into this part of the model. Getting down to the business side of things, the chassis’s, although not the same, could be mistaken for brothers. Pretty much a standard RTR slotcar layout with minor variations. Pioneer opted for the guide shoe with plug in braids and Scaley have used the trade mark guide with replaceable braid plate. In my view Scaley wins hands down here. Their guide set up is tried and tested and apart from a broken wire on a McLaren M23 in the early days, I have had no other problems with their guide across a range of more than several models. 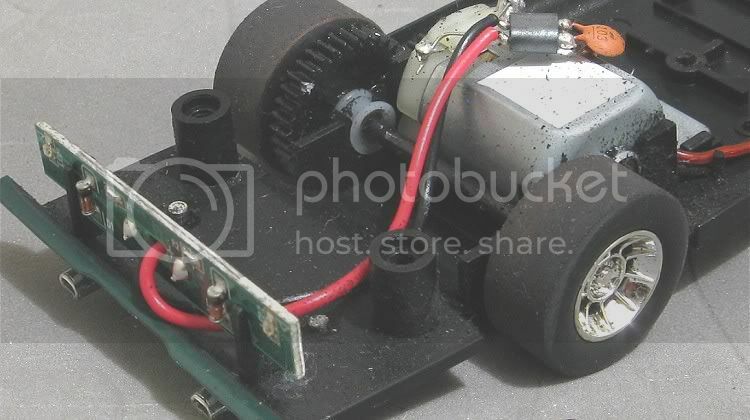 The Pioneer on the other hand is still the worst I have experienced in a slotcar. The guide has a peculiarly long spindle on it and it can move in and out at random, this in itself is not really a problem, but the fact that when the guide is fully home in its housing it still has an unacceptable amount of side play and front to back play. Not such a big deal on plastic track (or is it? ), but a decidedly week point for non magnet racing! The guide is able to move several degrees side to side in its housing and it can even move several degrees front to back, too. I first noticed this on the Mustangs and nothing seems to have changed. If there is a reason for this free play, I haven’t seen an explanation for it anywhere! Braid material for both models is fine. 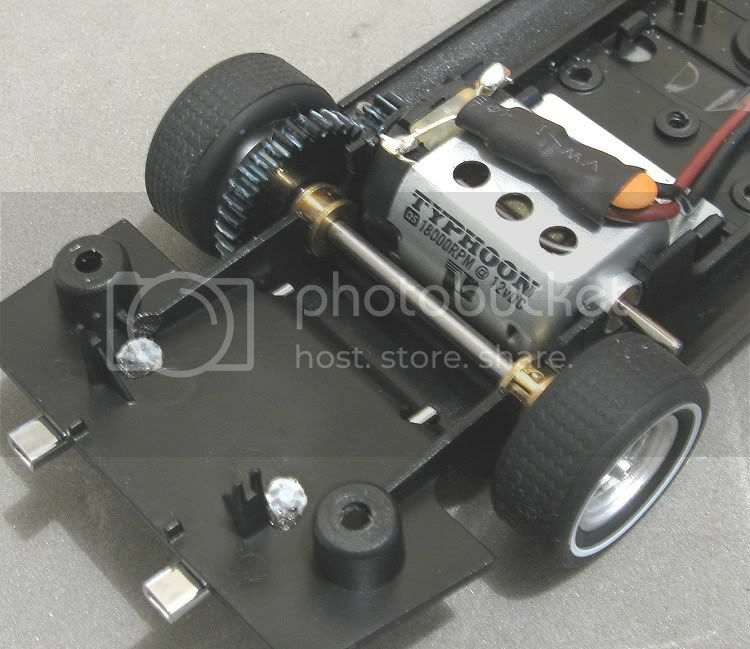 Both chassis have a similar sidewinder set up and both motors are firm in their clips. The traction magnets are comparable and also share similar mounting positions in their respective chassis. 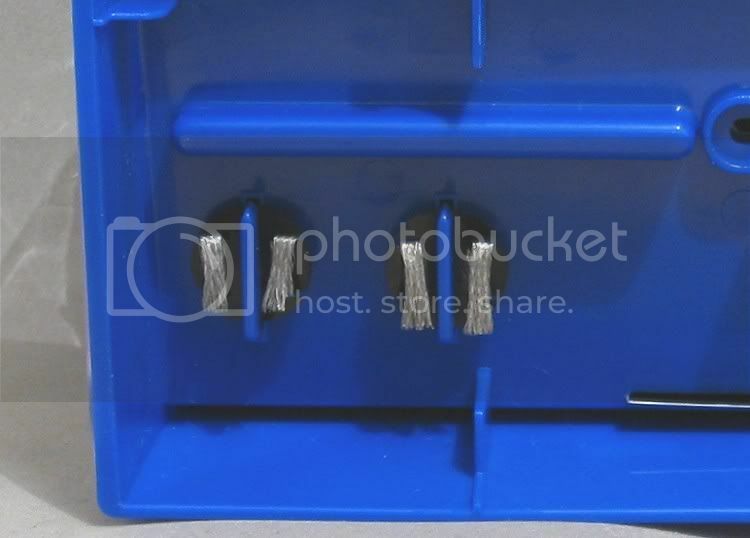 The motors also look to be the same performance range with the Pioneer can having ventilation holes in it. Axles are good and while the Scaley font axle is firm in its bearings, Pioneer have decided to let their front axle slop about a bit. Once again, probably fine for magnet racing but a minus for non magnet racing. Gear mesh for the Pioneer is very snug, I’d go so far as to say that it binds slightly in a couple of spots. It would be conducive to run this in for a bit before any serious competition work whereas the Scaley is probably the other way, giving it that distinctive Scaley sidewinder sound on the track. 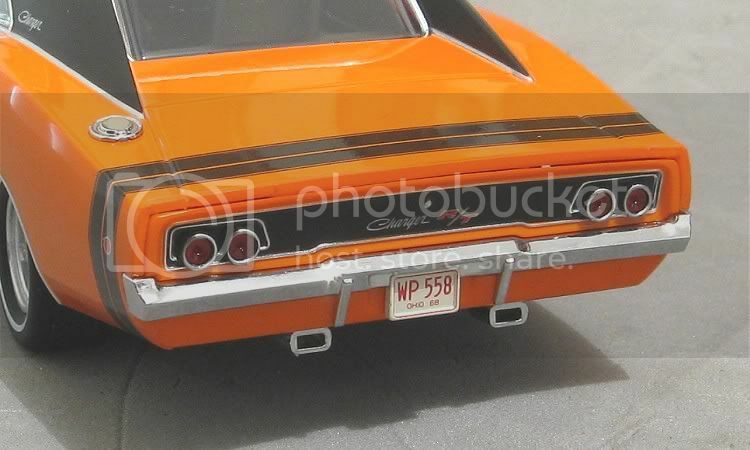 One extra thing you do get for your money with the Scalextric Charger is lights. Something we all cried out for ten years ago, but now..... I suspect most people could take them or leave them. All the same they are there and they work well. The lighting boards are not a firm fixture in the Scaley chassis so care needs to be taken when refitting the body. It is possible for either board to come out of the clips and any extra effort will see the clips break. The Pioneer on the other hand doesn’t have lights, but there are some familiar looking clips moulded into the chassis which look awfully suspicious? Some other things which caught my eye were small details like the chassis. With lights and the way the Scaley chassis finished at the end, it will be harder to get the body to float if you are a ‘loose body’ racer! The pioneer, on the other hand, has a flat chassis and has plenty of freedom to move if so desired. Pioneer have gone for an authentic license plate front and rear while Scaley have omitted anything coherent. Pioneer have gone to great lengths to fit a detailed interior, and part of that interior, as mentioned before, are remarkably well detailed internal door trims. Unfortunately, the trim on one side has not been attached to the body and the trim generates an annoying rattle while in motion. Both the Scalextric and the Pioneer cars are good on the track. I had the opportunity to test another Pioneer model against the Scaley one and you would be hard pressed to tell the difference. If anything, the Scaley handling is classic Scaley, very similar to their Trans Ams only slightly more susceptible to understeer deslots. The Pioneer model seems a little quicker but is quieter, which can be deceptive. If anything, it is a little more twitchy on the track and needs just a little more concentration and respect. Either way, results will certainly be down to the driver. Again, on board, they are both very similar; and again, the Pioneer does seem to be slightly quicker (and quieter). But without traction magnets coming into play I would say that the Pioneer was slightly better behaved. Other factors will determine which model is the best and this will be down to finish and modelcraft. I’m sure by now you might have guessed the ‘better model’ award needs to go to the Pioneer. In the absence of either model having decisive handling characteristics, the Bengal Charger is a winner based on its finish, choice of livery and fineness of detail. These features may well save it from the race track and consign it to the display cabinet, leaving the Scaley Charger to be the work horse. The Bengal Charger still has a serious problem with the guide, but that is fixable. The front axle can be fixed too, but you get nothing extra for the extra cost, not even lights. Both of these models are functioning slotcars, there is no ‘show pony’ about either of them and I would go so far as to say that they are both serious contenders in their class. 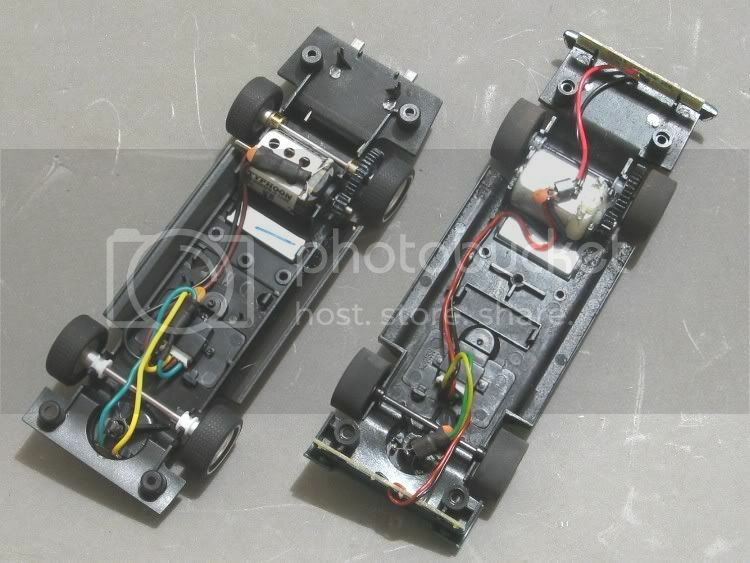 Pioneer have adopted (under license no doubt) the Scalextric DPR system for digital fans and apart from the lack of lighting , is probably a nose in front of the Scalextric car as the more desirable model. But, just to put you in the picture again, Pioneer Mustangs have an unhealthy habit of breaking and shedding loose wheels, and whether the Charger has inherited this habit or not is not yet proved!! Big deal? Maybe not, but Scaley overcame this annoying trait several years ago by using knurled axles. Pioneer still use a plain axle shaft. Scalextric supply a wide variety of spares for their models which should be available via your local Scalextric dealer. Spare parts for Pioneers at the time of writing are very difficult to source! Re: Pioneer v. Scaley Dodge Chargers. 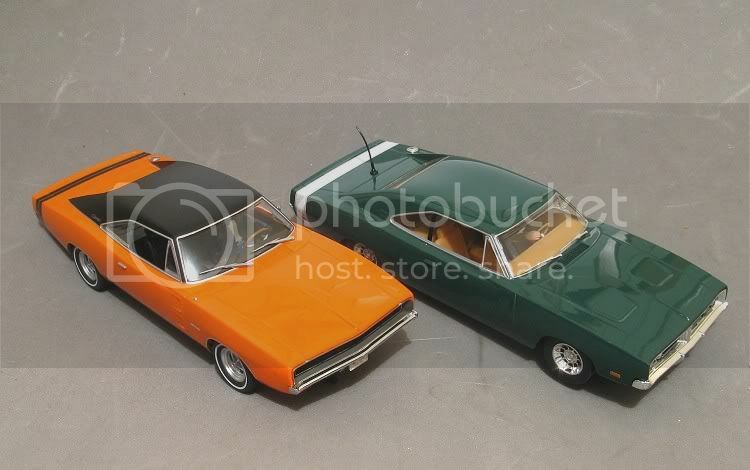 I have one of the Mustangs, a Pioneer chassis under a resin 63 Falcon and the Bengal Charger. 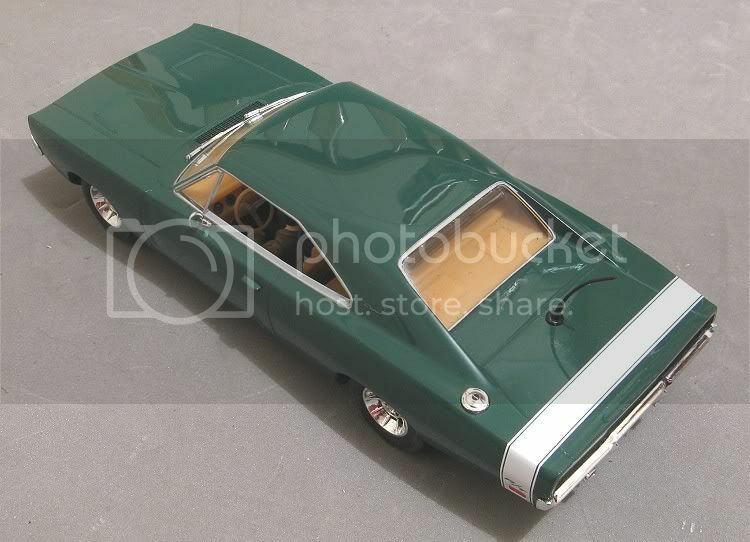 The only problem I experienced was some graphics coming off the Mustang (white notchback, #31) and when Jules was advised of this he sent a new body at once. If there have been problems with cars' OOB' let him know, he'll make it right. I normally contact him through the forum at Home Racing World where his screenname is just "Jules". 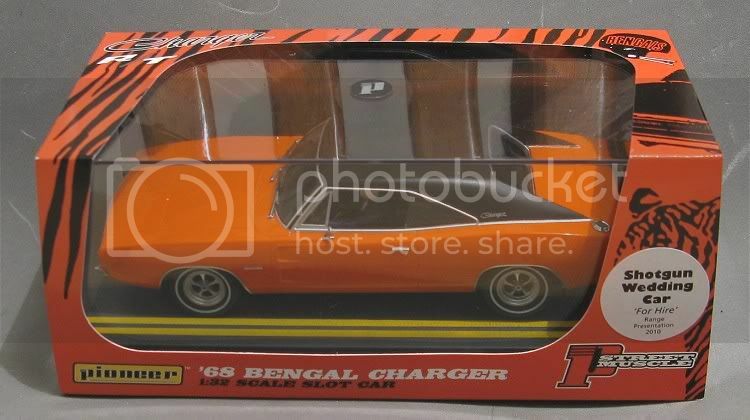 I was originally going to convert my Bengal to a vintage NASCAR but Pioneer has just released 2 "battle scarred" Charger liveries that are begging to be converted. Just my 2 cents. The couple of guys who have contacted me have replied to the contact link on the Pioneer website and as yet have recieved no reply (3 weeks?) I'll pass your information on. It's good to see the cars were supported from Pioneer, I have long accepted that plastic wheels can and quiet regularly let go. 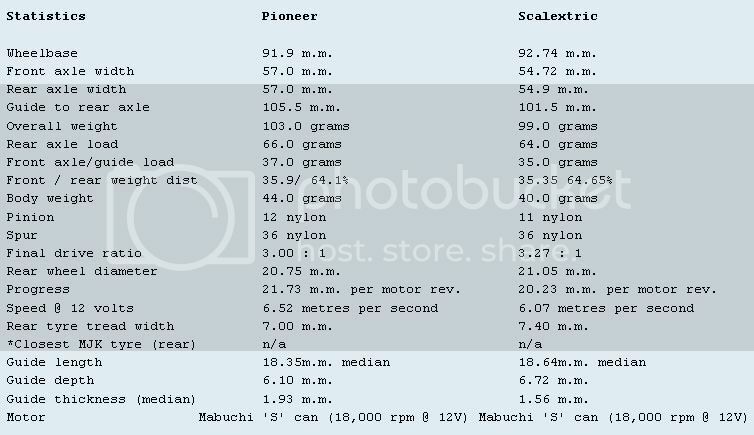 Quick Info on the Scalex Charger wheels. They are Cheviot Mag wheel replica's quiet popular in the 70's and 80's. 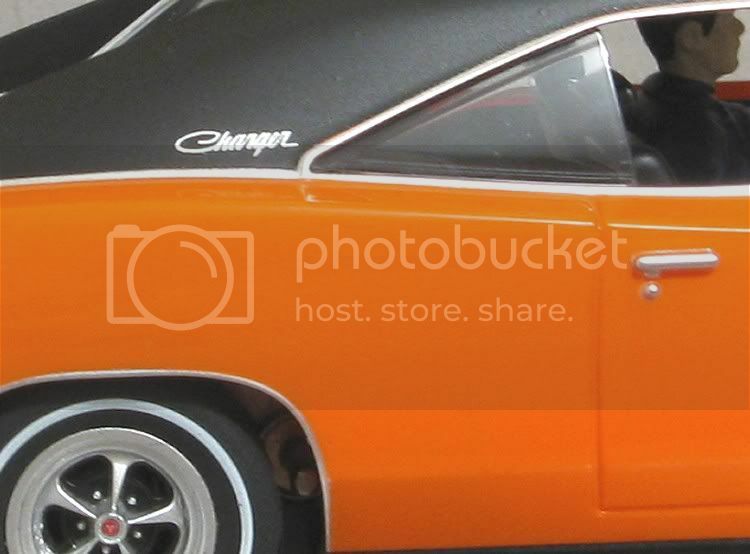 The wheels were made famous bolted to the Dukes of Hazzard General Lee Dodge Charger. 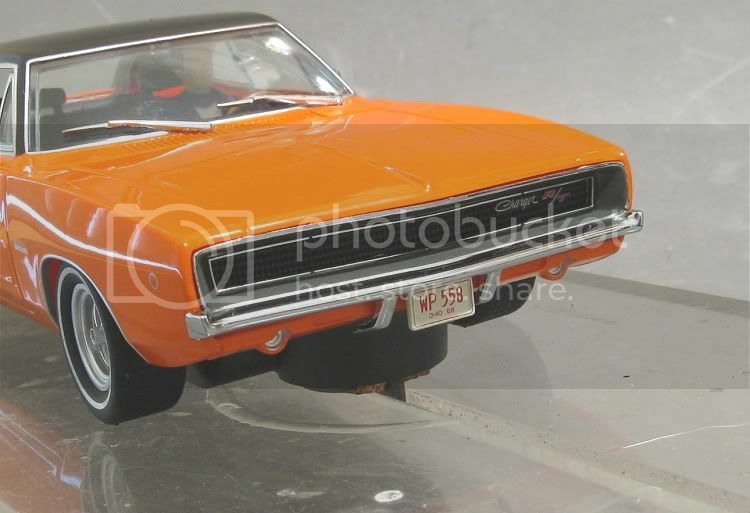 I would say the General was the big idea behind Scalex releasing a Dodge Charger, and the wheels they chose to use on all the Charger's they have released would confirm that. 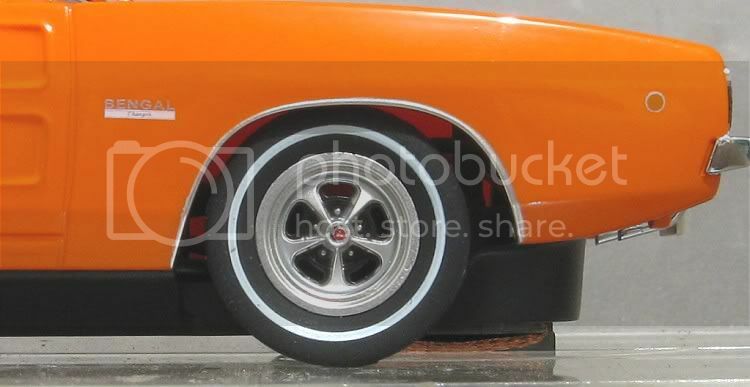 In short, the Wheels were black with a polished face, which even to punter's who do not recognize this wheel, make the Scalex Charger wheels look out of place covered in only Chrome.